Quick! Tell me what song you’re guilty pleasure jamming out to right now! I’ve been all about If I Loved You by Delta Rae aaand I may or may not have been obsessing over this little ditty, too. I think I’m responsible for 300 of those views but I’ve gotten it out of my system now. What. an. earworm. Anyway, suffice it to say if I get hooked on a song I have to listen to it a million times in a row on repeat. HAVE to. B hates this as he’s on the opposite side of the spectrum where he listens to a song once, twice if it’s the best ever, and then shuffles that ish. Not everyone can be blessed with that kind of willpower. Just like with music, when I get on board with a flavor, it’s all I want to eat for the foreseeable future. It’s been BBQ overload over here, guys. Partly because it was one of the few things we had in bulk in our fridge during our abstention from grocery shopping, and mainly because it’s just so good! 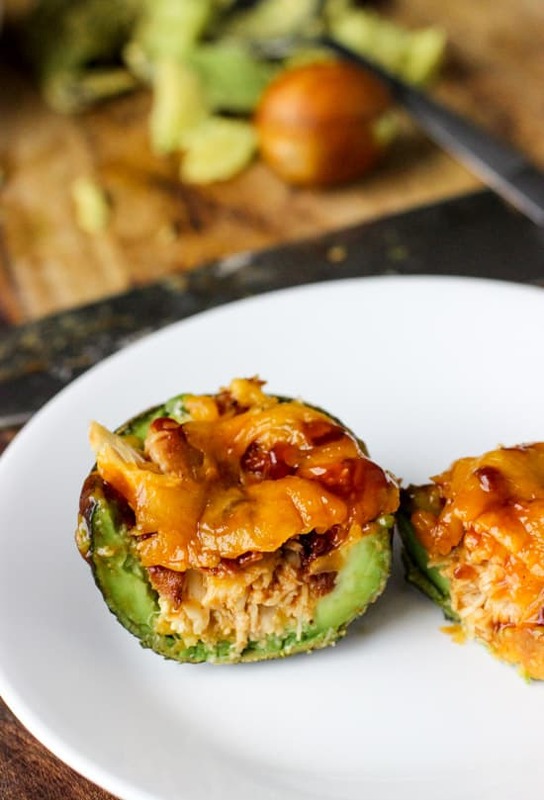 Unlike a bunch of guilty pleasure tunes, I can say with near certainty that I will probably never get tired of BBQ pulled chicken, sprinkled with bacon and covered in cheese, all tucked inside an avocado. Nooooope. Put this one on repeat, baby! So I’m a little late to the avocado boat party (at least I didn’t miss the…boat) 😉 but better late than never! 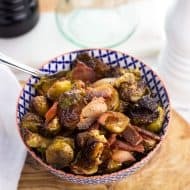 What a fab way to combine so many guilty pleasures (BBQ, bacon, cheese) and sneak in some nutrients, too. A few weeks ago I shared that I got my first ever crock pot. Let me tell you we’ve been mass producing pulled chicken like nobody’s business. Seriously, I’m tempted to call the city and tell them they need to rezone our apartment lot from residential to commercial, because we’ve got a serious pulled chicken factory operating in full force over here. As you can imagine, multiple batches of pulled chicken + two mouths = a lot of leftover chicken. 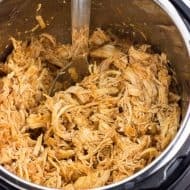 Not that that’s a bad problem to have, just that I didn’t want to run into pulled chicken burnout, especially only a few weeks into owning a crock pot. 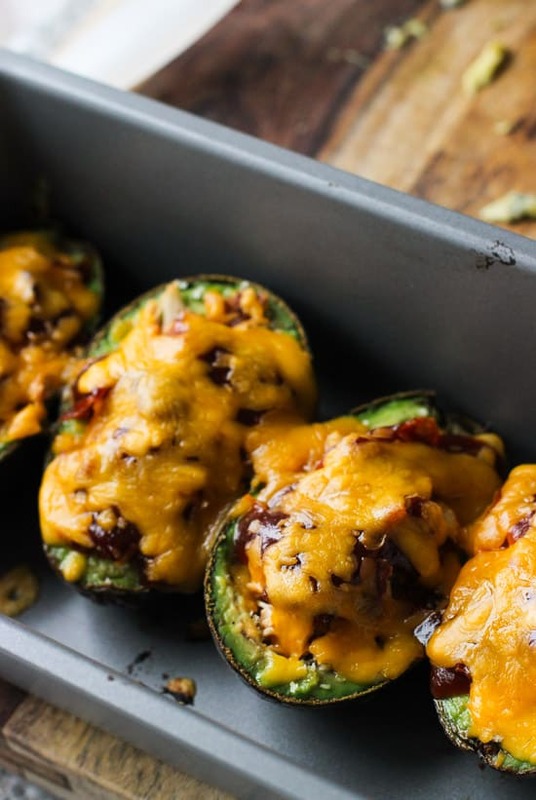 These avocado boats were a welcome change from the standard pulled chicken sandwich and c’mon…any opportunity to eat bacon? Can’t pass that up. Underneath that delish chicken is a brush of olive oil, a sprinkle of panko breadcrumbs for crunch, and a pinch of shredded cheddar. 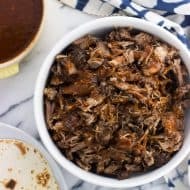 So far we’ve followed Ali’s 2-Ingredient Slow Cooker BBQ Chicken, which for real couldn’t be simpler, and we *love* it. If you don’t have a slow cooker – no judgment, that was me a few weeks ago. 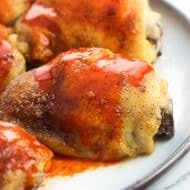 You can prepare chicken in your preferred method and then shred, or take an itty bitty short cut and use a rotisserie chicken. Then – more cheese! Duh. Throw ’em in the oven for a bit until the cheese melts and they’re heated and you’re all set to chow down. If you’re wondering what kind of pan I have them in, it’s a 9″ x 5″ loaf pan. The recipe below calls for two avocados, so four halves, which fit perfectly side-by-side in a loaf pan of that size! No chance these babies are rolling around and spilling any of that delicious filling. Not on our watch. 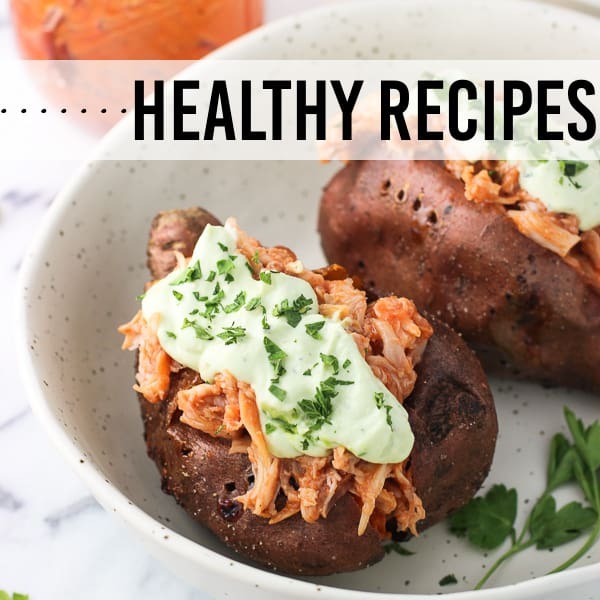 These BBQ Pulled Chicken Avocado Boats are a simple and flavorful way to combine all your favorite flavors! Great way to use those chicken leftovers. Arrange the four avocado halves peel-side down in a 9" x 5" loaf pan, or in a small dish where they won't have much room to roll around. Brush inside of avocado halves with approx. 1/2 tsp olive oil and sprinkle approx. 1/2 tsp panko inside each. Sprinkle about 1 tbsp of shredded cheese over each avocado on top of panko. 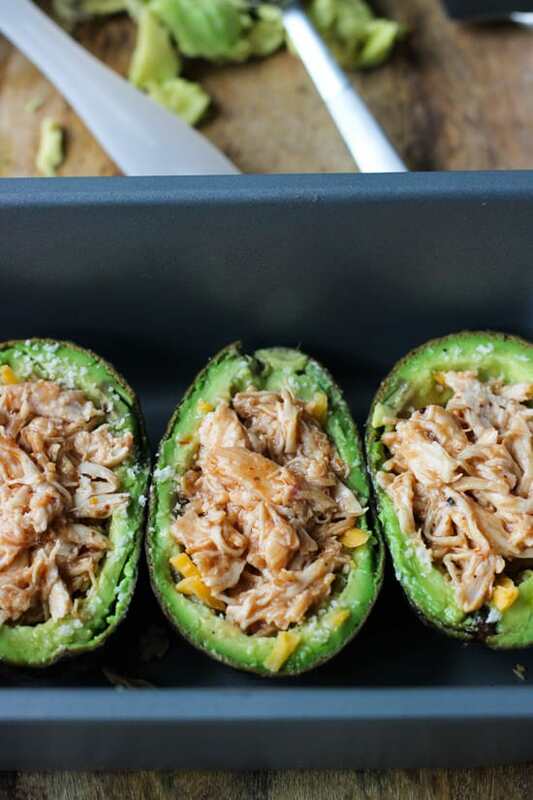 Add about 1/4 cup of pulled chicken to avocados, pressing slightly to fill avocado. 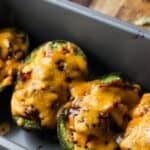 Sprinkle bacon crumbles evenly over four avocado halves and add BBQ sauce to top. Lastly, sprinkle remaining cheese evenly over top of avocados. Place pan in the oven for approx. 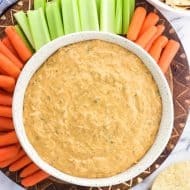 10-15 minutes, or until avocado halves are heated and the cheese is melted and slightly bubbly. Serve while warm. As avocado oxidizes quickly once sliced, these avocado boats would be best prepared and cooked just prior to eating. Love these avocado boats! They sound ridiculously good! 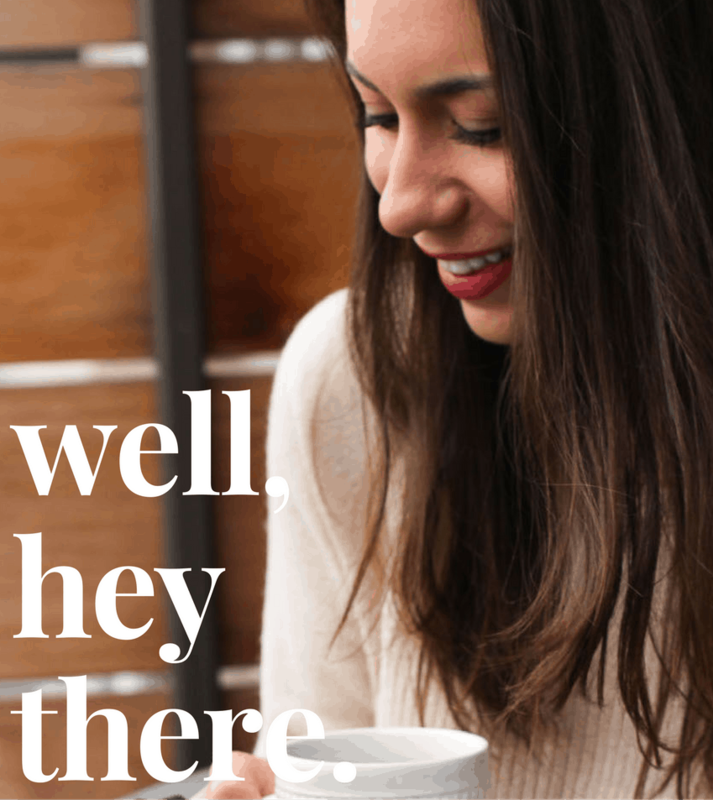 Oh, I am SO like that with the re-listening to music and re-making recipes I like! Haha! 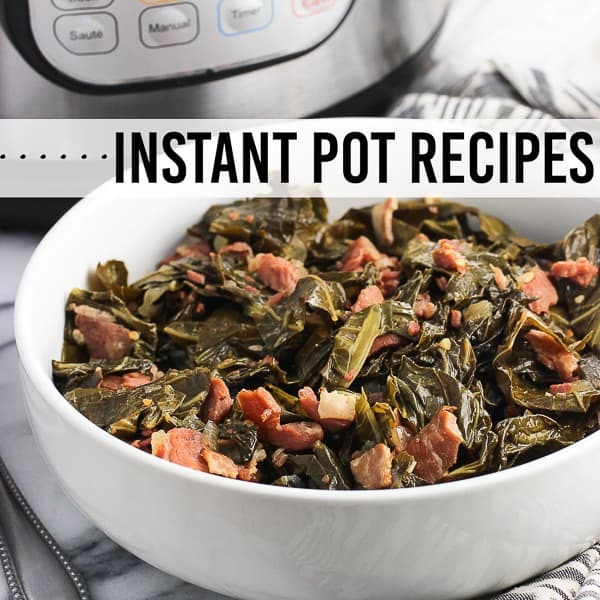 I just bought a crockpot too and haven’t yet got around to making any pulled chicken or pork – but that was what I got it for! 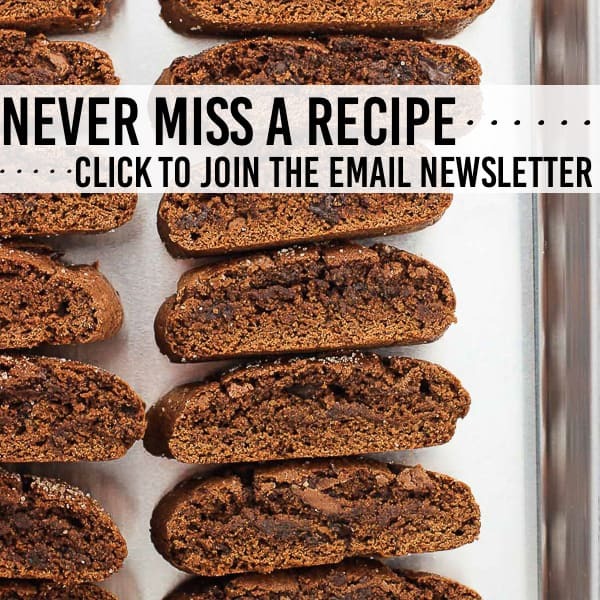 (well, not quite, but almost …) Anyway, thanks for the reminder and for this beautiful recipe. Love every ingredient in it! Well it certainly seems like the season for crock pots, doesn’t it? I still can’t believe it’s so easy haha! Thanks Helen! OH.MY.GOSH. I have no words. None. This is just incredible. BBQ, chicken, and avocado are the trifecta of all trifectas. Drooling over here! These are so fantastic! Pinned! Thanks for the pin Jocelyn! These avocado boats are so wildly creative — I love them! They look so healthy and delicious — I would’ve never thought of this. Great idea, and I’d love to try them! I have far too many guilty pleasure songs and I don’t think I want to admit to any of them! 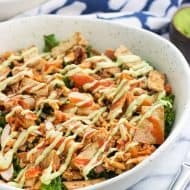 These avocado boats are such an amazing idea and I see them making an appearance on our superbowl menu! Whaaaaa? This is genius. Oh my gosh I am drooling. Pinned! Wow, these look delicious! 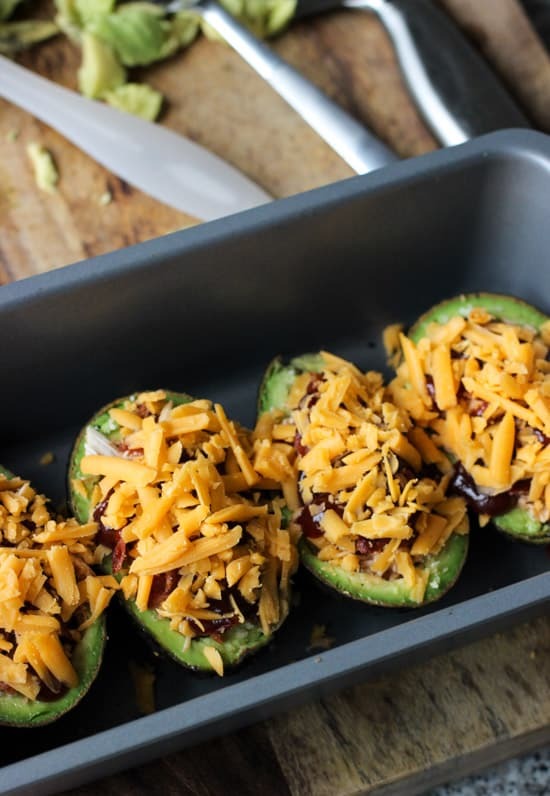 I love that you made avocado boats, that’s such a great idea especially with the bbq pulled chicken and cheese! The flavors sound amazing and I can’t wait to try this! These look crazy good! And anything by Hunter Hayes. I’m a country girl at heart! I’m the same with songs! Lately I’ve been playing Bang Bang on repeat, esp when working out. 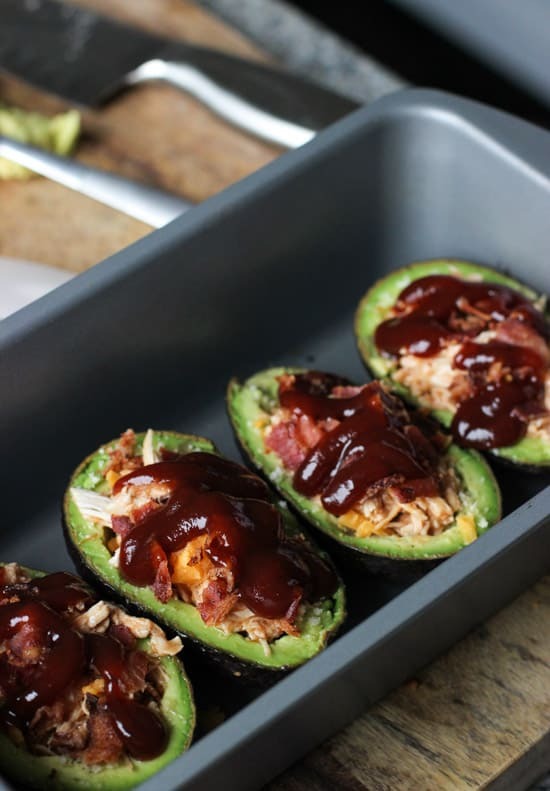 I would also want BBQ pulled chicken on repeat, esp on these avocado boats! This sounds so good! I’ve actually never cooked an avocado boat either. But this sounds delicious! This. Is. Brilliant. Whhhhhy do I not eat these every single day?! I am totally in love with the flavors in this! Making this week! Thanks Annie! I’m with ya – I’d gladly eat this for dinner every night! And with the amount of pulled chicken we have in the fridge/freezer, I think I could! Haha glad I saw the light with crock pots. I don’t know how I’ve lived so long without them! These are totally speaking my food love language! Loving the flavors in this!